This theme provides a remarkable layout with interesting features that will spur interest in your event, whether you're running a music festival or informative business conference. Extra features and pages like a countdown, schedule and speakers provide a trove of information for any would-be attendees to spark their interest and generate a sale. Aiming for the mobile crowd? 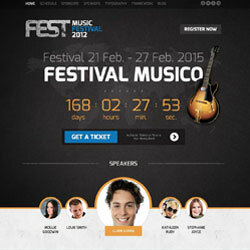 Fest is fully-responsive for a superior experience on all devices. 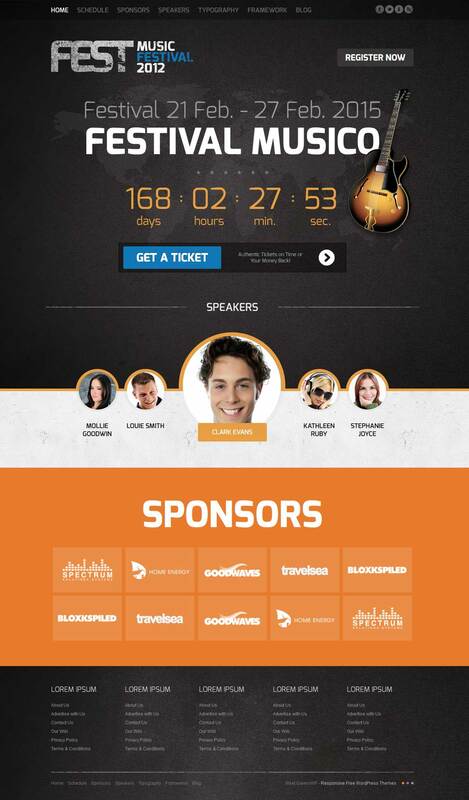 Exclusive plugins and custom HTML elements combine for a stand-out design that will bring in the crowds.A big, bold countdown with dates and the event title dominates the header, so visitors know just how long there is to wait till the event kicks off, or remind them of the limited time available in which to get their tickets! All text and images used are modifiable, so you can amend it to suit your needs. An event won’t go very far without acts, so our Fest-exclusive GK Speakers plugin add animated speaker avatars to show who will be attending; essential information for those on the fence about coming along. There's also a sponsors section, so you can provide ample promotional space for the companies making your festival possible. Additional pages have been prepared for sponsors and speakers, allowing your users to glean in-depth information about the whos and whats of the event. All your information can be linked to right from the front page, and each page is enhanced with our custom typography options and is just as visually-pleasing as the frontpage, so you can keep people interested every step of the way. If users need to know how the event's going down, a unique schedule page will fill them in. A dedicated blog section lets you bring all the latest information on the event to your fans, and social media functionality means your posts can be quickly shared across the work to generate interest and bring in more interested parties and sponsors. Get the right guest, and you might find your attendance shooting up! Use Fest as the basis for your event site, and make it one for the record books.